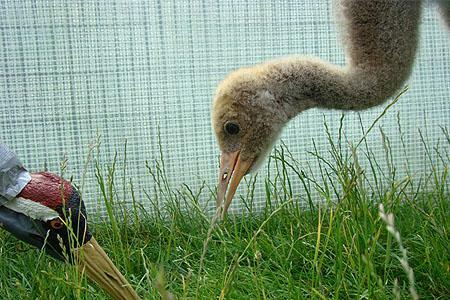 June 2013: Billy is the most aggressive of all the 2013 cranes. He goes out of his way to chase all the other cranes around the enclosure and had to be kept separate from the other birds for quite a while during the rearing. He finally began to calm down at the end of June. 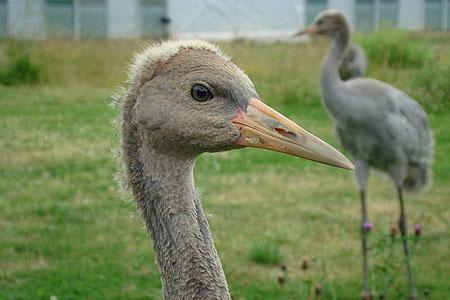 Billy, a male bird, has a sibling – Skye - a female crane. September 2013: Billy is turning into quite a monster of a crane - he's enormous. Time will tell how he fits in, as aggression may not be the best strategy when he has to mingle with bigger, older, stronger and heavier birds. 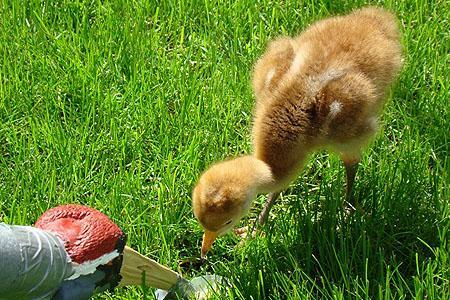 January 2014: Billy was released in mid September and his aggression didn't seem to cause any problems with him quickly integrating with the older birds. The autumn was spent foraging with the flock on West Sedgemoor and along the Stoke St. Gregory ridge, and the winter on splashy pasture land on Stanmoor near the village of Stoke St. Gregory. The deep and prolonged flooding that affected the Levels and Moors through December and January does not seem to have had much of an effect on the new cohorts' welfare or integration. January 2015: Billy spent all of 2014 as an integral part of the non-breeding and non-moulting flock on the Levels and Moors and towards the tail end of the year was frequently seen feeding in with a group on Southlake and Aller Moors to the west of Langport. July 2015: The spring of 2015 saw Billy remain part of the non-breeding flock on the moors, spending a lot of time on Northmoor (Aller), Northmoor near East Lyng and West Sedgemoor. February 2016: Billy spent all the autumn and winter of 2015/16 on the Somerset Levels and Moors spending time in the main flock largely on Wetmoor, Aller moor, and West Sedgemoor. He is not yet obviously paired with any particular bird - but this could all change over the next few weeks.... July 16: Remained at Slimbridge throughout the winter. There were signs of nest buildingat the end of April in the 50Acre/100Acre area but no eggs laid. Nov 17: Billy has been missing since September 2016 and is presumed dead.